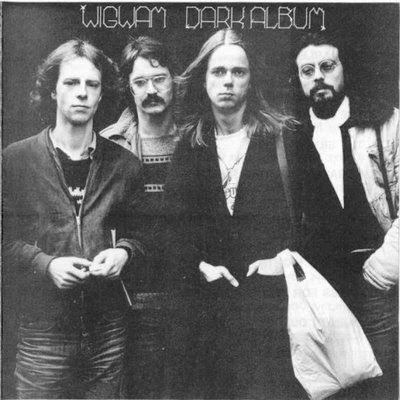 When the now titled Dark Album (Love Records LRLP 227) was released in late 1977, Wigwam had ceased to exist. This was a pity, as the album in itself was a great improvement from Lucky Golden Stripes And Starpose and, more important to the fans, featured Jukka Gustavson as a guest musician. Unfortunately, Love Records were facing bankruptcy by 1978, and had no means of supporting Wigwam, which also meant that the band dissolved. An (un)official Wigwam Farewell Show took place at Punkarock festival in the summer of 1978. The ironic part about all of this was that Wardance, the proposed single off the album, was a funky number that would have surely been a hit and made stars out of this band. To rub salt into the wound, Virgin Records released a double album of Wigwam material calledRumours On The Rebound (VGD 3503) that featured a whole album's worth of material from the Dark Album which the label had previously rejected.